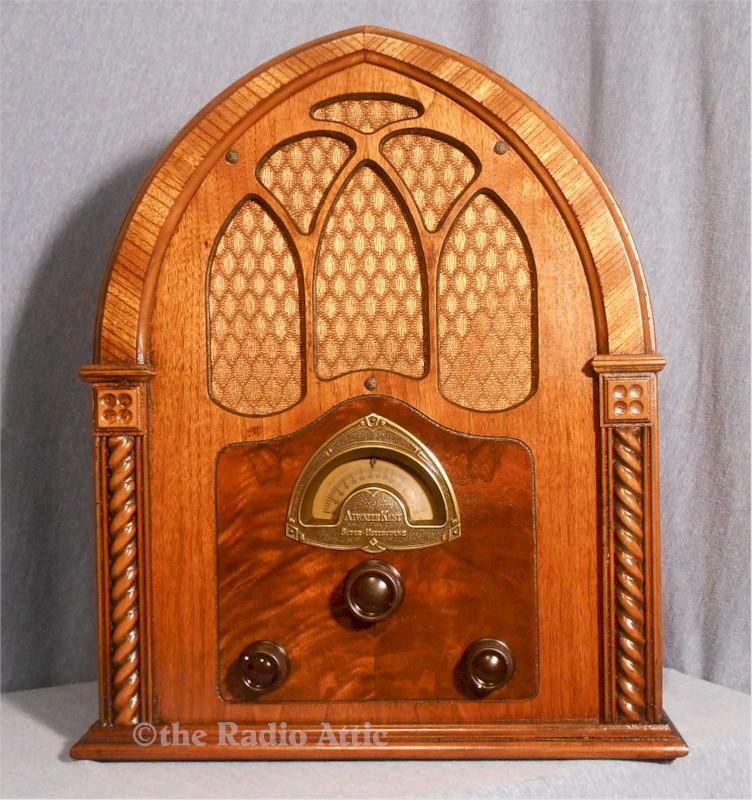 This classic large cathedral radio is from the early depression era. The gracefully peaked front, flanked with exotic zebra-wood veneer and twisted side pilasters, combined with the Gothic-style grille cut-outs and a brass escutcheon that mimics the upper arch, puts this firmly among collector favorite radios. It is an AC-powered seven-tube superhet covering the standard broadcast band. Like all the Atwater Kent cathedral radios, it is highly coveted by collectors. It has been restored inside and out, performs very well, needs a short wire antenna (included). A complete tuneup with all new capacitors, tubes and resistors checked and replaced as needed, was performed. The cabinet was expertly restored with nitro-cellulose lacquer and looks super; there are no veneer repairs. Grille cloth and knobs are original, speaker is original and in very good condition. Chassis is very clean and pics are available, just email me. Aux input cable was added so you can plug in an iPod, CD player, etc., and play audio through the radio. 90 day warranty applies. An excellent addition to any collection! 19"H x 16"W x 10"D.